The initials R.C.I.A. 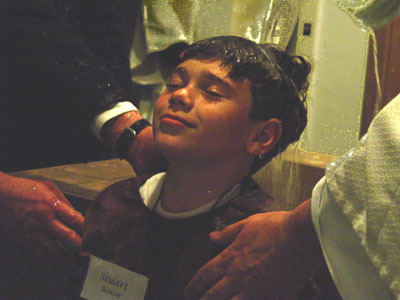 stand for the Rite of Christian Initiation of Adults, which includes a series of liturgical celebrations that mark people’s passage into full initiation or entry into the Catholic Church. This is a restoration of the ways in which people were brought into the faith in the first centuries of the church. Children who have “attained the age of reason” (about seven years old) go through the same process, with some adaptations geared towards their abilities and understanding. 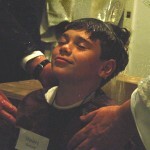 In the ancient church, the “Sacraments of Initiation,” that is, Baptism, Confirmation and Eucharist, were all received at the same time as part of a person’s entry into the Church. Vatican II reinstituted the ancient catechumenate process. This is a process to assist adults and school age children who are interested in becoming part of the Catholic church. We meet weekly as we journey and share our faith stories and the faith stories of the Bible. If you have any questions about RCIA or wish to join RCIA, please contact Daniel, our Director of Faith Formation, at dvalcazar@stmartin.org or (408) 289-9608. Inquiry (or Pre-Catechumenate) is the time when those participating can begin to discern what God is calling them to. It is a time to ask many questions, share their stories, and learn more about what it means to live according to the Gospel as a disciple of Christ. When the Inquirers are ready to take the next step, they celebrate the Rite of Acceptance into the order of Catechumens. With this rite, the Church, with full participation by the Community accepts their intention to respond to God’s call to follow the way of Christ. When the Catechumens are ready to take the next step, they celebrate the Rite of Election or Enrollment of Names. This rite signals the beginning of the final preparation for the Elect to follow Christ more closely and with greater generosity. As Catechumens, the participants will spend an indefinite period of time as they grow in their faith by reflecting on the Word of God. Each Sunday, they will be sent forth from the Liturgy after hearing God’s Word proclaimed to the Church, to reflect further on how God is speaking through the Scriptures and through their lives. Thursday evening sessions may take on a more structured content at this time. After having spent sufficient time as Catechumens, being nourished by the word of God, they will enter into the period of Purification and Enlightenment as they celebrate the Rite of Election on the first Sunday of Lent at St. Joseph’s Cathedral. This Rite marks their entrance into a more intense time of reflection and conversion as they prepare to celebrate the Sacraments of Initiation (Baptism, Confirmation and Eucharist) at the Easter Vigil. This period of the process takes on a more reflective and introspective character as they celebrate the Scrutinies, on the third, fourth and fifth Sundays of Lent. Sacramental Life begins for our Elect at the Easter Vigil when they experience Baptism and Confirmation, and are then welcomed at the Eucharistic Table for the first time. This is the normative way worldwide for adults to enter the church. After they have celebrated the Sacraments of Initiation at the Easter Vigil (see the Triduum page) the period of Mysatgogia provides time to consider and savor the on-going mystery of their faith as they participate fully in the Eucharist with all the Church. In a sense, all members of the community also share in this experience as we together contemplate anew the sacramental mysteries.